Corporal (Ret) Key will make his own comments below the map. I drew this map in early 1952 and mailed it home to my mother. 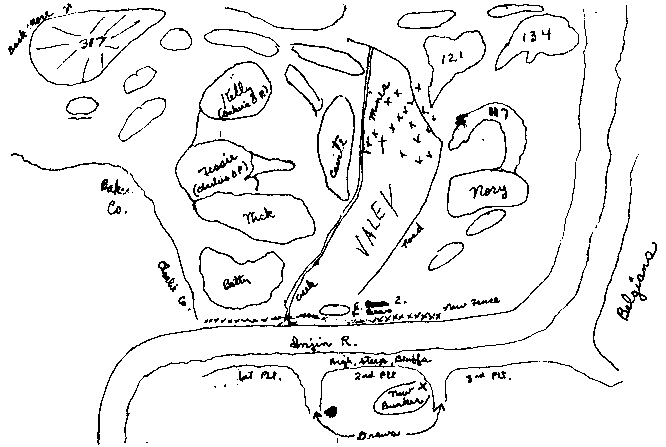 I'm pretty sure it was early in 1952 because Captain Pearson's map shows the 65th Rgt to be on our right and his notations were added after mine. Maybe Poe will remember when the fence was completed and can set me right if I'm wrong about the timing or what outfit was then on our right. Seeing real (to scale) maps and photos of the area for the first time only after starting the Bunker pages, I'm pretty proud of the job I did with the map. If you don't agree with me, then how do you expect a skilled operator to work with inferior equipment? There are, of course, a few obvious mistakes in the map. For instance, I spelled Nori as Nory and called Hebert Two "E-bear 2". The big one for me was failing to respect the importance of Breadloaf, the hill between Kelly and 317. Later on, that error was corrected. The spelling of "VALEY" ain't too good either. The arrows at the bottom of the map point to two draws, each of which was the position a machine gun bunker sometimes serving as my abode. Notice the creek and road, neither of which can be seen in the recent photos of Kelly and Nori, but may be discerned on Captain Pearson's map by better eyes than mine. MK.